How are you all going? You still with me for post number four tonight? 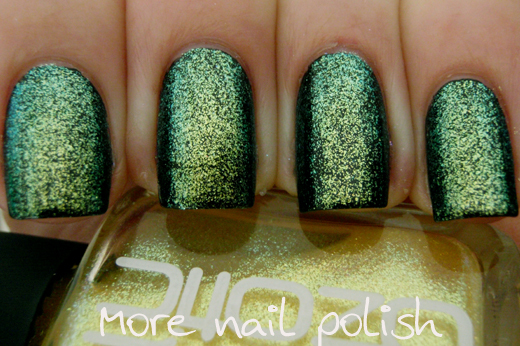 Here is the last of the Sugar polishes and this one is a yellow shifting to green glass fleck polish. 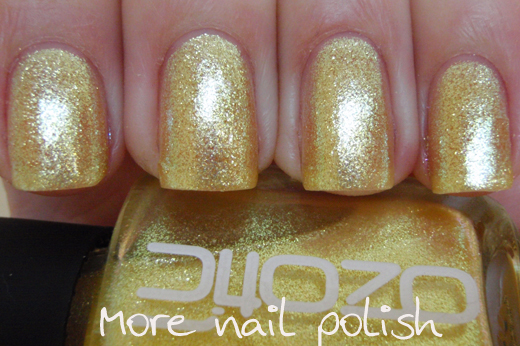 In the bottle Ozotic 904 Sugar is a golden canary yellow with iridescent yellow glass flecks. 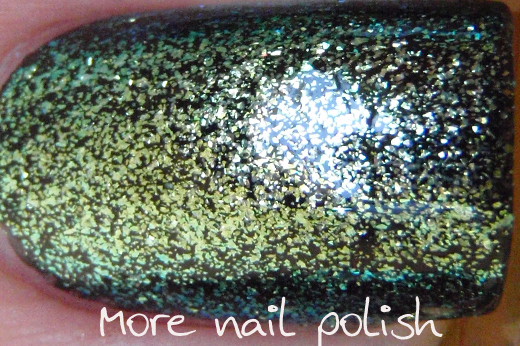 You can't really see the colour shift in the bottle, but on the nail it's very obvious. Here is one coat of Ozotic 904 sugar over a black base. 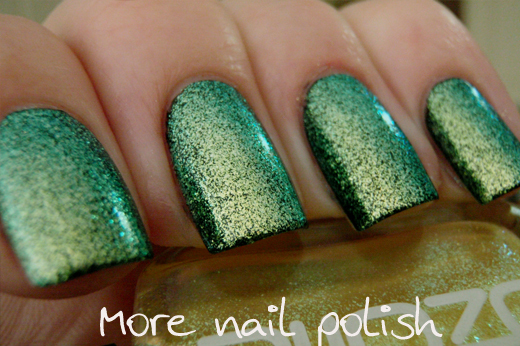 Again, care is required for a single coat otherwise it may look patchy. 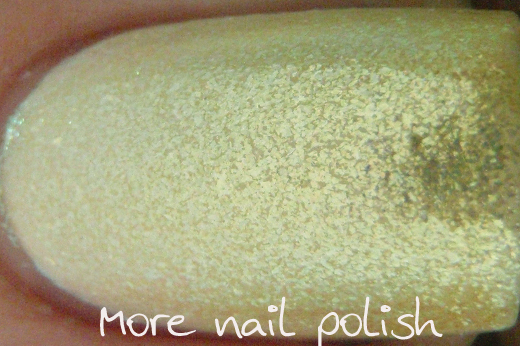 If you don't need to see the base colour between the glass flecks, then go with two coats. Macro shot shows one coat of 904 over black. Now onto the pictures with two coats. These nails seriously look alien like, I really love this uniqueness of this polish. These photos in the shade make it look very matte, but rest assured the finish here is glossy and glassy smooth. Over white you can clearly see the light canary yellow base. 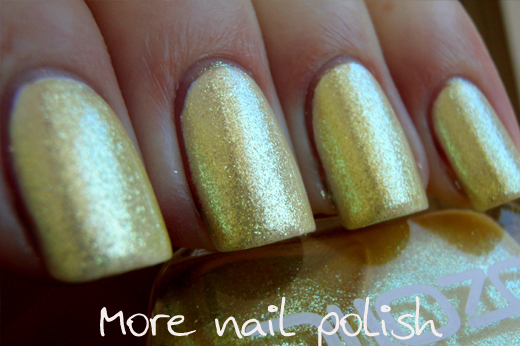 It's a very pale yellow but its also unbelievably sparkly. The glass flecks are so reflective because of their size that when you get light bouncing off them they look almost wet. 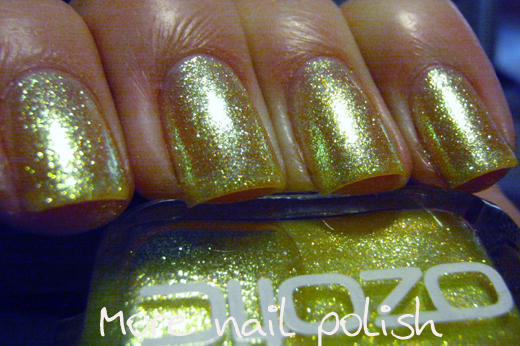 Here is Ozotic 904 on its own at three coats. With out the white base it seems more gold rather than yellow. I really love this one on it's own. 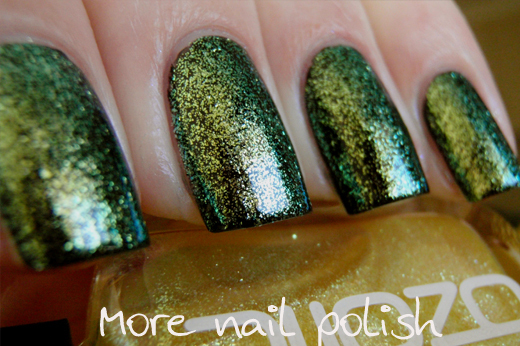 I can just imagine this layered over many other colours to give that golden glass fleck shimmer. Formula on this one was also very good for me, not runny and not thick - just right (just like Goldilocks). This one is probably my favourite out of the Sugar collection because of it's unique colour. I love the blue/purple ones, but I feel this one is less common and pretty cool, I also don't think I've seen anything like these in a commercial brand polish. 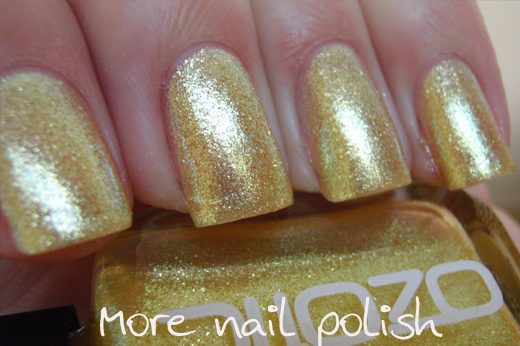 I especially love this one on it's own, it's such a shiny yellow gold foil. 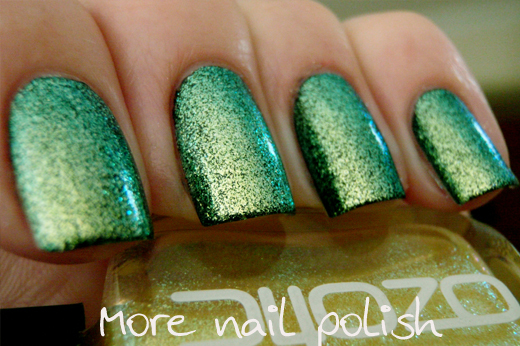 That's all the Ozotic Sugar polishes. What do you think? Which do you like the best? Have you seen anything like them before? I'm a little bit disappointed in them, to be honest :( They remind me of the TKB Star Bites pigments that you made top coats out of ages ago when they're layered over black (and by themselves/over white, just the pigment with a bit of coloured tint in the base). 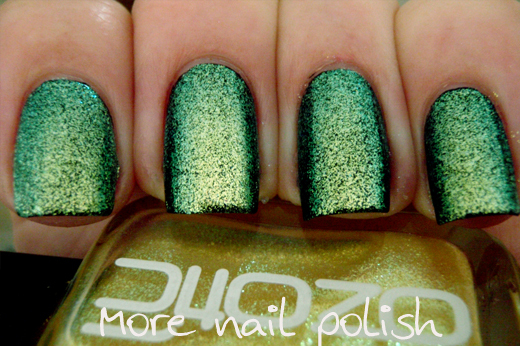 I'd love to see some comparisons between your duochrome glass fleck top coats and these ones. I agree they are quite similar to the TKB Star Bites. I'll see what I can do with the comparisons for you. 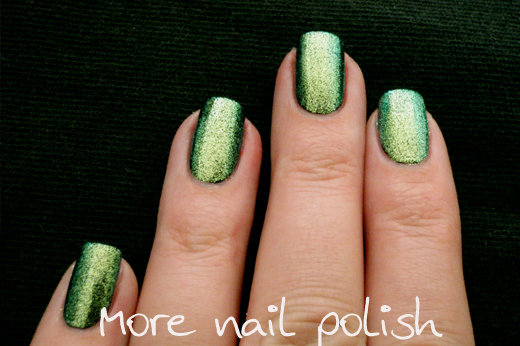 I still think they are beautiful polishes, especially for those that do not franken. 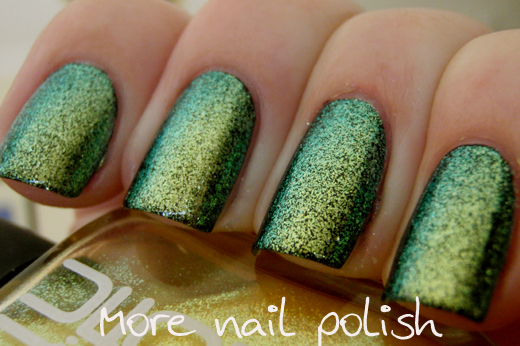 I'm seeing 'too easy to dupe to bother buying' colors here....and colors that have already been done 20 times before. Disappointed Ozotics!